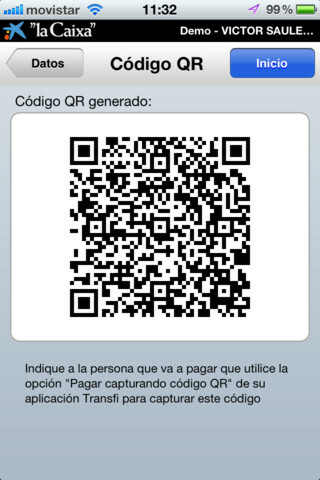 Spanish bank ‘La Caixa’ launched a mobile app tapping QR codes for P2P payments. This new application, called Transfi, allows users to transfer of funds P2P automatically using QR codes. The service facilitates and calculates exact amounts, send messages or email reminders, facilitates sharing costs, sends notices for pending charges and payments, and allows automatic payments. Transfi de la Caixa (@InfoCaixa) has already a version available for the iPhone and is expected to release an application for Android and other mobile operating systems. When using Transfi, the user must enter the total amount of the account as well as the number of people who will be sharing expenses. He must also specify whether to transfer accurate costs or rounded upwards or downwards. Transfi also facilitates mobile transfers by generating a QR code that can be sent to many people. Thereby, the payments are made instantly. This only requires both people creating the payment and the application itself. The new app also offers alternative tools to facilitate fund transfers by sending a message or email with the amount to contribution and the account number. It completes its service by sending receipt and payment reminders that can be configured according to the user’s preference. How can an app like la Caixa’s Transfi change their banking customers’ behaviour? Do you see QR codes play an important role in the uptake of mobile banking in Spain and the rest of the world? We invite you to share your thoughts about the digital payments and mobile banking, here, via twitter or on our Facebook page.